These Abusers Aren't Allowed To Own Guns. So Why Aren't States Removing Them? On the worst night of her life, Nicole Beverly was beaten almost unconscious by her husband and then forced to sit beside him as he loaded and unloaded his gun, threatening to kill her. “I was sure I was going to die,” she told The Huffington Post. Paralyzed with fear, it took her five months to tell anyone about the abuse and seek help. One crisp Michigan morning she did, filing a restraining order and fleeing with her two children. But after Beverly was granted the order, she was horrified to find out that the gun her husband had used to terrorize her remained in his possession. But Michigan -- like most states -- doesn’t have a law requiring people with domestic violence restraining orders to actually surrender their firearms to authorities. Without a mandatory state process in place to remove his guns, Beverly's husband was left armed and dangerous. Across the country, states are failing to keep guns out of the hands of abusers who are prohibited under federal law from having them. According to data collected by Everytown For Gun Safety, a gun violence prevention group begun by Mike Bloomberg, the majority of states don't have legislation that's equivalent to federal restrictions. That's important: While an abuser may be barred federally from owning guns, without a state law on the books, local and state prosecutors can't bring charges against him. 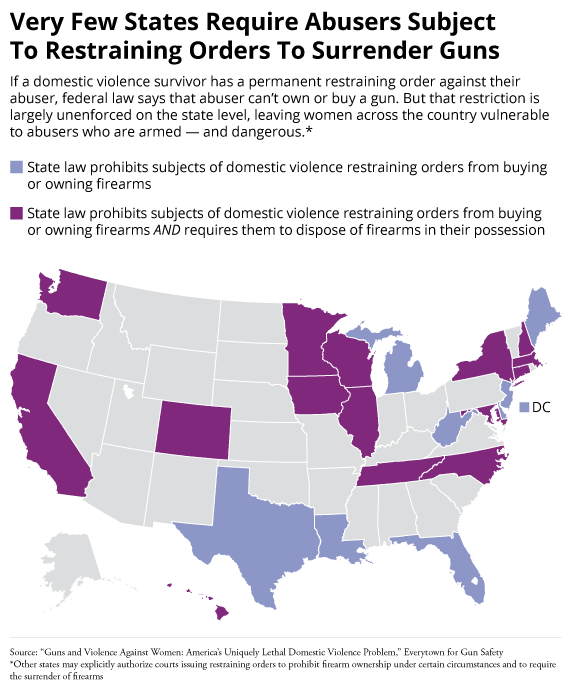 As the map below shows, only 23 states and Washington, D.C., prohibit people with domestic violence restraining orders from owning or buying guns. Just 15 states take this law a step further, requiring that firearms be surrendered once a qualifying restraining order is issued. So while Michigan, where Beverly was living at the time of her abuse, is one of the states that prohibits abusers subject to restraining orders from owning guns, it doesn't mandate that abusers relinquish their weapons. In the map above, states without shading have varying laws around the issue. Some states allow but do not require judges to prohibit abusers subject to restraining orders from owning guns, or to order abusers to surrender their guns. In these situations, the judge can use his or her discretion. Around three U.S. women a day are killed by intimate partners, according to several domestic violence advocacy groups, including the National Network To End Domestic Violence. Experts on the topic say that women are in the most danger when leaving a relationship -- and that’s why it’s imperative that authorities prioritize disarming abusers once a restraining order is granted. There are no national statistics on the percentage of domestic homicide victims who had restraining orders against their killers at their time of death, but research has indicated that restraining orders are violated around 40 percent of the time. There's also some evidence that strengthening gun laws for abusers may save lives: According to one study, states that restrict abusers subject to restraining orders from accessing guns have been associated with reduced rates of domestic homicides. One argument against gun restrictions is that if an abuser is determined to kill, he’ll find another way. David Adams, a psychologist who has interviewed dozens of batterers who killed their victims and wrote the book Why Do They Kill? : Men Who Murder Their Intimate Partners, said that the research suggests otherwise. One study found that the presence of a gun in a domestic violence situation makes it five times more likely a woman will be murdered by her abuser. Over half of all women killed by intimate partners between 2001 to 2012 were killed using a gun, according to the Center for American Progress. Adams said the more time that passes post-separation, the safer it becomes for the victim. “Confiscating a gun from someone who is prone to these impulsive acts of retribution is incredibly important -- really the difference between life and death,” he said. In 2014, six states passed laws that will help keep guns out of the hands of abusers. The legislation varies in each state, from requiring that abusers subject to restraining orders surrender their weapons to giving teeth to existing surrender laws. The recent progress is credited to a dramatic shift in position by the National Rifle Association, which has long stood firmly in the way of state efforts to strengthen gun laws. As HuffPost previously reported, over the past year or so, the gun lobbying group has scaled back its opposition to domestic violence bills. For survivors of domestic violence like Beverly, just knowing that abusers have been stripped of their guns can offer some needed emotional relief. "I knew his guns were the easiest way for him to kill me," she said. "With a gun, he wouldn't have to be in as close of proximity to harm me as with a knife or his fists, and my chances of survival would be much lower." Beverly's ex-husband is now in prison after repeatedly violating the restraining order and stalking her. "While I know that there are many illegal ways to purchase firearms in this country and that he could have easily bought another gun on the street, knowing that he didn't have easy access to his own guns did lessen my anxiety," she said. "Having a loaded gun pointed at your head is not something that you ever forget." Prime Minister Stephen Harper shoots .303 Lee Enfield rifle in Gjoa Haven, Nunavut on Tuesday, August 20, 2013. The prime minister, who was on his annual tour of the North, is no stranger to the rifles. During a previous visit, Harper got down on the ground, sniper-style, and fired off a few shots during target practice with the Rangers.